You may have noticed that even though you have a car charger, while you use the phone in the car with GPS navigation running, that the battery steadily discharges, and then goes flat. Well its because many car to USB chargers do not put out enough current, even though they say they do. Many put out the USB standard 500mA which is not enough to replenish the phone when you are running with the screen-on, 3G and GPS all at the same time. You need to get a higher power charger. So, how to tell what you've got? 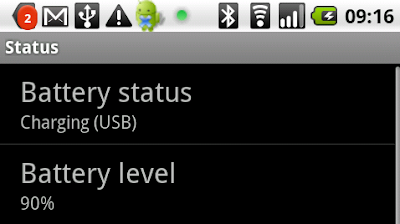 Plug in your phone and then go to Settings -> About phone -> Status, look at the Battery status. You'll see Charging (USB) if you're on a low power charger like USB from a computer,and Charging (AC) if you have high power / mains charger. You'll also notice that trying to charge an N1 over USB power is very very slow... now you know why!